Being a recent transplant to NYC, I have the advantage of being able to view the city and surrounding areas with the fresh eyes of someone still in "tourist-mode." 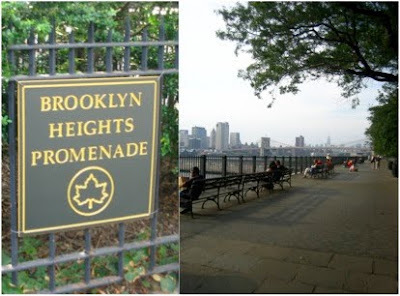 And having recently moved into the charming neighborhood of Brooklyn Heights, I am still pinching myself for having the Brooklyn Heights Promenade and Brooklyn Bridge Park within 5 minutes of where I live. 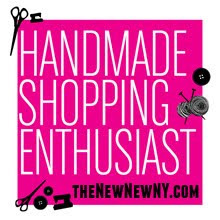 If you haven't yet had the chance to venture out to these local (and free!) treasures then you don't know what you're missing! After exploring the park, venture on up to the Brooklyn Heights Promenade for a panoramic view of Manhattan and surrounding areas. In the words of New York Magazine, it "draw photographers, couples on romantic walks, and New Yorkers who want an inspiring place to sit and think." In my words, it's simply amazing and must be experienced first-hand. For directions to the promenade click here. For a list of events taking place at the park click here. A view down the promenade towards the Brooklyn Bridge/DUMBO. The promenade starts near Montague Street in Brooklyn Heights. 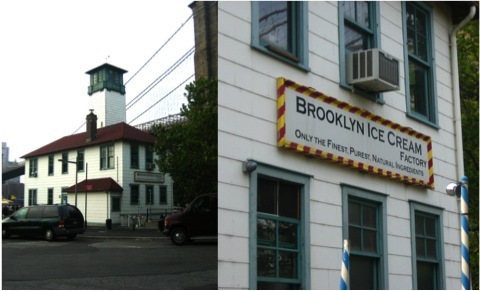 No trip to the Brooklyn Bridge Park is complete without a stop at the Brooklyn Ice Cream Factory (located near Pier 1). Off Pier 1, an amazing view of the Manhattan skyline and the Brooklyn and Manhattan Bridges. One of several play areas for the kiddos. A massive flight of granite stairs — Brooklyn’s front stoop, if you will — bisects the park. Called the “Granite Prospect,” this stairway was made from steps salvaged from the Roosevelt Island Bridge reconstruction. Beautiful! I am moving to Brooklyn in December. I can't wait! My boyfriend lives in Greenpoint right now, and that's where we are planning on getting a place! The best bridge in the world!